1 outfit idea, 3 ways to pull it. Gossip Girl mania days are gone now... Still, we can't deny the fact those days were pretty good as they were filled with lots of fashion and style. Blair, Serena, Chuck, Nate, Dan... each one of them pulled a personal style direction that evolved throughout all 6 seasons. Now have you ever thought how Blair Waldorf would look like today? What would her style be like? In terms of modern day fashion. Now here's a very festive challenge. And idea. 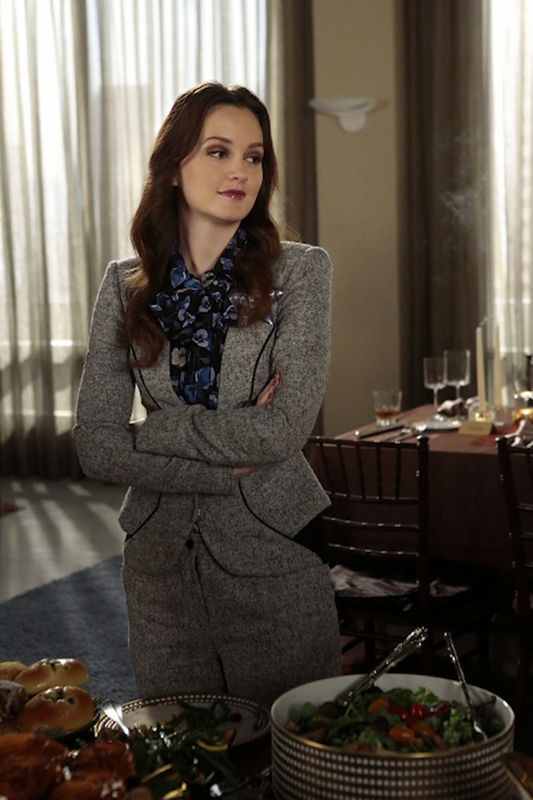 Remember Blair's Thanksgiving look in season 6? Grey pantsuit, blue blouse and black shoes. Sounds like quite timeless combination. A combination, or formula, that can easily be pulled this coming Thanksgiving Day. So, challenge accepted. 1 outfit idea - 3 ways to reproduce it... Wide-leg pantsuit, tunic-blouse and velvet boots... Casual pantsuit, lace-d blouse and brogues... Wool pantsuit, chiffon blouse and classic pumps... Which one is your favorite? I know, she's such an inspiration. Glad to hear you like her style as well!